The client requested flat solid seats and that the table be fairly chunky. A chunky table requires a fairly solid chair, provided by the 45mm-section legs and solid seat. Only five chairs? I also made a bench as part of the suite so the sixth chair was not required. An important part of the design process is the creation of a full-size drawing and dowelled and screwed mock-up in pine. This enables you to try out the seating position for comfort. If you have to change the mock-up, reflect these changes in the drawing and templates. To discourage the sitter from sliding off the solid seat it is set at an angle of about 2 1/2 to 3 degrees below horizontal. Using the full-size drawing, create a cutting list and machine the components. The back legs are shaped using a curved template. 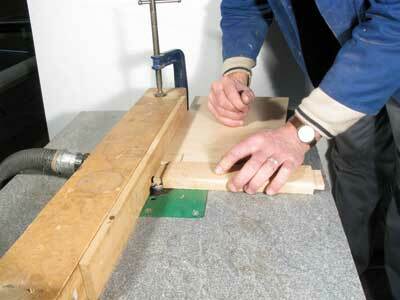 Form the template in 9mm MDF using a router and trammel, photo 2. For long distance trammelling I replace the fence rods with long 8mm threaded bar. At the pivot end I use a spare router fence slider drilled to receive a 3mm pin. I also use another slider fixed midway to provide added stability. Unless you have a ridiculously large workbench you will have to work on the floor at this point. Fix the template material to the floor with some waste material below to protect the floor, and establish the centre point for the inner curve. 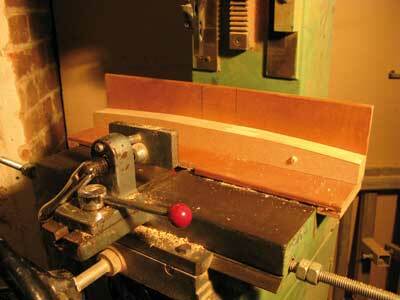 Cut the inner curve, photo 3, then reset the trammel length for the outer curve. As the leg is tapered the centre pin will also have to be moved. Cut the template to length, making it about 50mm over length, so allowing for fixing the template to a waste area of the leg piece and also providing a lead-in when machining the shape. Create a short flat area at a tangent to the curve where the rail is mortised into the leg; this will save having to curve the tenon shoulder and will not be noticeable. Mark onto the template the position of the rail mortises. Fit the template to the leg piece by screwing into areas that will later be mortised, or into waste areas at either end. 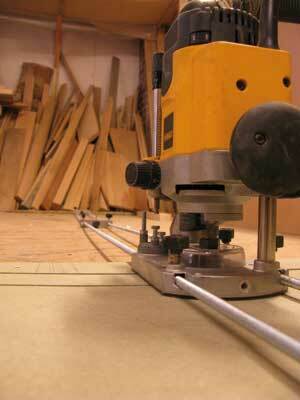 Shape the leg using a bearing-guided template trimmer on the router table, photo 4. The extra length on the template allows engagement with the bearing before cutting. 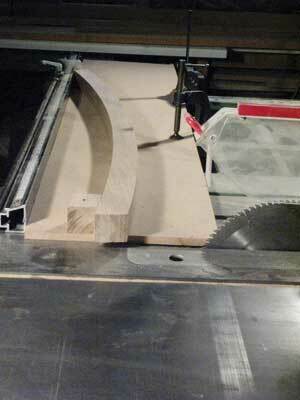 Stress is also reduced by bandsawing the majority of the waste away; the router is just for final trimming. Before removing the template transfer the markings for the mortise positions. Now cut the waste from the ends of the back legs. Mark off the positions of the top and bottom by measuring from the side rail mortise. Use a simple jig on the saw table to ensure that the ends are cut at the right angle, photo 5, this being ascertained from the drawing. The 3 degree angle at the top of the front legs could be cut now, but I left this until I could mark it off when dry assembling. 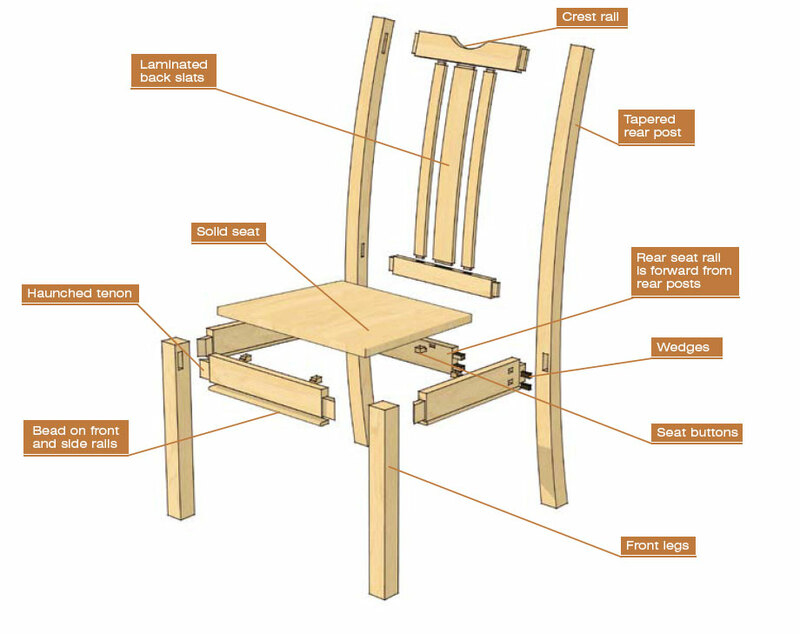 The 3 degree slope on the seat requires a slightly angled front leg mortise. To simplify jointing into the back I arranged the curve of the back legs and the flat on the curve for the rails so that the rails are at 90 degrees to that flat. 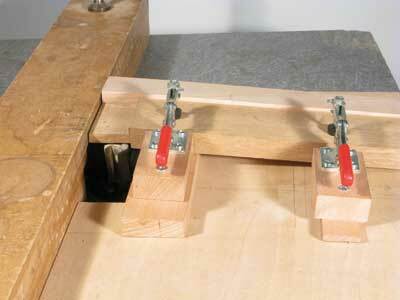 The leg mortises are complicated by the shape of the back legs, necessitating a number of jigs. All the mortise and tenons are 9mm. Although the side rails are splayed the mortises are cut square to the leg faces, the splay being created by angling the tenons. For mortising the back legs to the side rail make a curved block to support the piece in the mortiser. 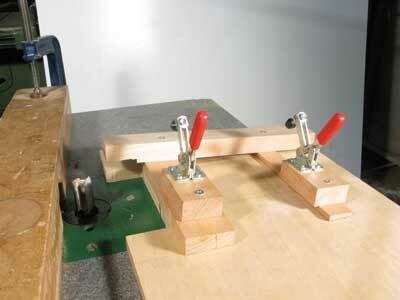 Fit the block to an L- shaped backing piece that can be clamped to the mortiser carriage, photo 6. 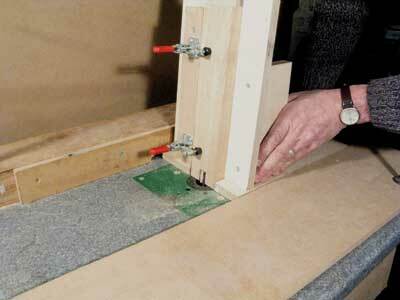 By shifting the leg on the support block an angle of 90 degrees between the flat and the chisel can be achieved. Mark off the back-piece mortise position as a reference for subsequent legs and set the stops on the mortiser so that the mortise is repeatable, photo 7. Remember to reverse the settings between the left and right legs. For mortising the legs for the back rails a concave curved block is used, again attached to the L-shaped backing piece. To ensure accurate positioning of the leg, thus enabling the mortiser stops to be used, drive a couple of screws into the curved block so that they fit really snugly in the rail mortise. 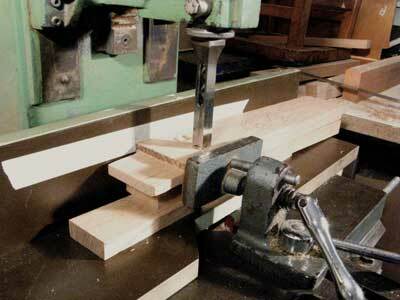 To cut the side rail mortises in the front legs at 87 degrees, use a sloping packer under the leg, photo 8. Finally, mortise the side rails to receive the forward-positioned back rail. As the through tenons are on display, some care must be taken when mar king out and cutting the mortises. 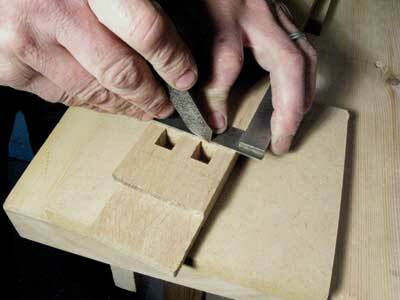 Using a sliding bevel, square the marking round both faces, and mortise from both sides to prevent breakout. A sloping packer is required under the piece to angle the mortise, photos 9 & 10; pick the angle from the full-size drawing. When laying out the mortises ensure that the spacing between them matches the width of a router cutter as this will make cutting the tenons much easier later. For a batch of chairs cutting tenons by hand would be tedious, so I remove most of the waste from the sides using the bandsaw, then trim them precisely using the router table. If the shoulders are not very wide they could be cut on the router table alone, but if you need to take two settings on the table I think it is quicker to remove the waste with the bandsaw. This approach requires that the rails are cut precisely to length; bear in mind that the side rails are inclined 3 degrees from horizontal so the front ends of the rails need to be cut at that angle. Saw the majority of the waste from the tenons on the bandsaw approximately 2mm oversize. The tenons on the front and back rail are straight, but on the splayed side rails they are angled; this angle is picked from the full-size drawing. Use an angled packing piece against the fence to hold the rail at the correct angle when sawing the tenon sides; a stop on the packing piece helps to hold the rail in place. 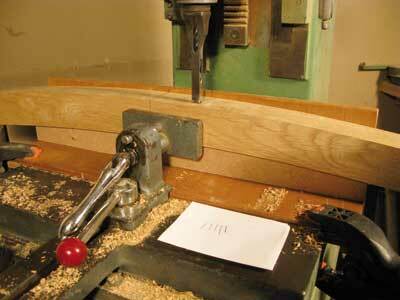 The tenon should also be sawn to width. 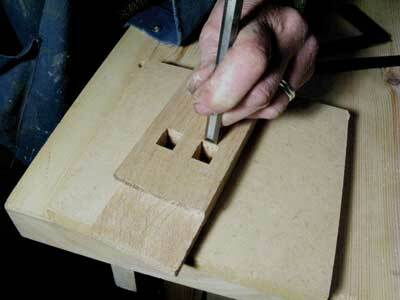 A shoulder is not required on the lower edge of the rail as a bead is applied which will act as a shoulder and cover any imperfection in the mortise. The front rails should have a haunch at the top. 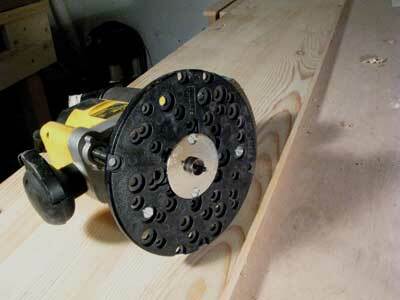 I have a rather primitive router table setup, made from a kitchen worktop without a sliding fence. 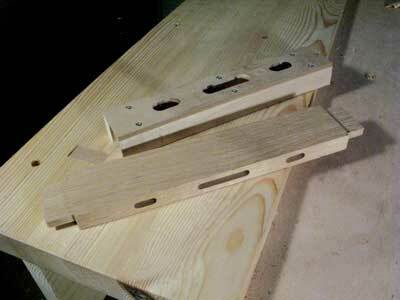 It is possible to trim tenons by using a board against the fence to slide the rail piece at the correct angle to the cutter, photo 11, and this system could be used for the front and back rails, but would be difficult for the compound-angled side rails, involving various angled packing pieces, so a jig is required. 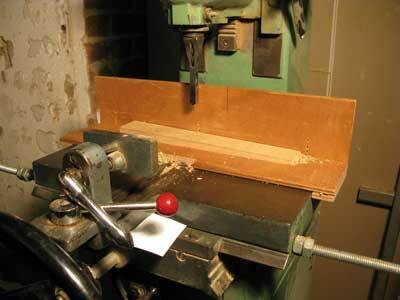 The jig consists of a baseboard with a recess to allow for the travel of the cutter. Fit two angled blocks to hold the piece at the correct angle for cutting the tenons to thickness. Fit another block to hold the piece at the correct angles for the shoulder, 87 degrees at the front and 90 degrees at the back. Toggle clamps are used to hold the rail in place, photo 12. To trim a tenon, offer the jig up to the fence and locate the end of the rail piece against the fence, photo 13. After cutting the shoulder the jig can be moved away from the fence to remove the remaining waste towards the end of the tenon. If your router table has a sliding fence this can be used to set the angle to the shoulders, but a similar arrangement will be required to cut the tenons to the splayed angle. Now for the through-wedged tenons. A similar calculation can be made for the width. Blocks on either side of the template allow the rail piece to be clamped firmly in the jig, photo 17. The 12mm-thick back slats are laminated from eight 1.5mm pieces. These can either be bandsawn or made from purchased constructional veneer. The three curved slats are laminated as a single piece on a former, the tenons cut, then the piece is cut to width to give a set of slats with continuous grain. When the back comes out of the press clean up the edges and cut it to length. The length can either be read off the drawing or marked from the dry-assembled back. Cut the short tenons on the ends of the slats before they are separated. This is best done using a simple jig on the router table to hold the back at the correct angle as it is passed over the cutter, photo 18. On the bandsaw cut the back into separate slats and clean up the edges with a plane, using the former to assist in holding the pieces. Form the shoulder on each tenon. Fit 8mm-wide bead pieces to the underside of the seat rails. 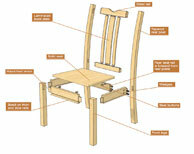 The seat is fitted using expansion brackets similar to those used on the table, see last issue. Dry assemble and clamp to ensure that all joints go together satisfactorily and that you have enough clamps and blocks. Check the top of the front legs to ensure that there will not be too much work to level them to the rails. Check the through tenons - I have them protruding though the rails about 2mm. Mark off the line of the tenon protruding through the surface and, after disassembly, chamfer the tenon to this line. This is easier done now rather than after glue up. Prepare the wedges for the through tenons, about 30mm long, tapering from 4mm to 0.5mm. There are a lot of joints here, some of them to be wedged, so glue up must be in two stages. Assemble the back and front separately, then later glue up the side rails and the back rail with the wedged joints. If your through-tenon wedges are identical, driving them in the same depth should make them the same width when trimmed to the top of the tenon. I used hammer and block so that I was driving them both in at the same time. 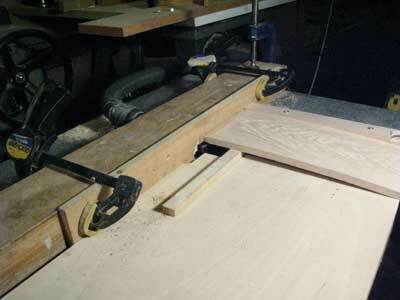 After the clamps come off, trim the wedges back and clean up the top and edges of the tenon. 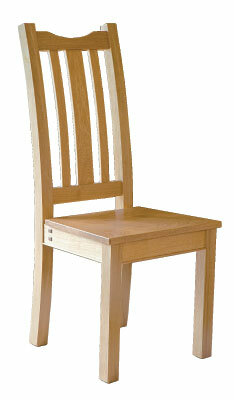 I used the same finish on the chairs as I used on the table, namely rag-applied polyurethane. On delivery the chairs looked good with the table. 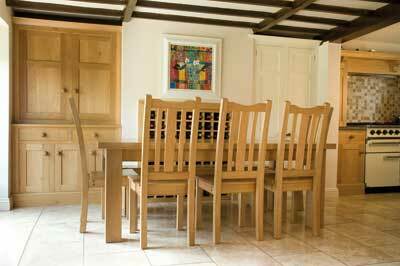 The clients had asked for a simple dining suite that would compliment their kitchen-dining room. Seeing them in position I think the brief was satisfied. In another situation a drop-in seat, possibly leather upholstered, would be more elegant. "In another situation a drop-in seat ... would be more elegant"
A chair can be given greater unity if the grain is similar on all faces on the front legs and follows the curve of the back legs. For front legs, when looked at from above the annual rings should run diagonally from corner to corner. This will give straight grain on all four faces as opposed to wavy and straight on alternate faces if the rings run parallel to the faces. material for the legs from the outside of the board where the annual rings usually drop away. For the back legs, where possible select pieces with the grain following the curve of the leg. This is aided by having the annual rings running diagonally towards the centre of the chair. The leg template is a useful aid to selection. 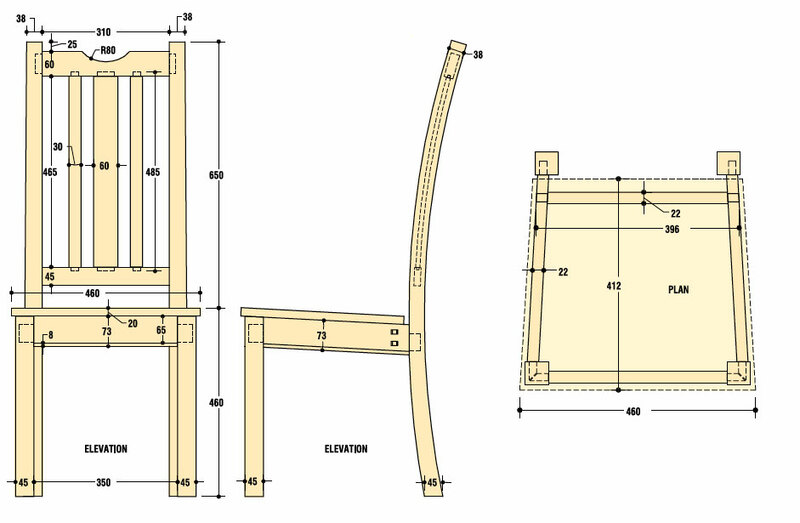 In my original plans for this chair I intended that the back legs would be the same thickness from top to bottom when looked at from the front. During making I decided that they would look better tapered by about 7mm so that the section at the top was a square. Another jig is required to cut the tenons on the back rails. This consists of a baseboard with a backboard angled to hold the rail at the correct angle to cut the tenon shoulders. Toggle clamps hold the rail in place. 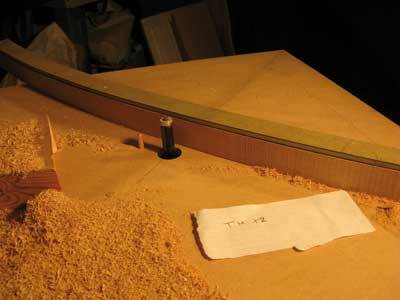 The baseboard runs between two fences to ensure accuracy when pushing the piece over the cutter, photo 14. 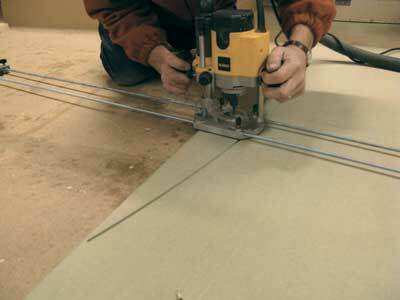 Make test cuts on an offcut to set up the position of the fence. If you laid out the mortiser spacing correctly the spacing between the tenons should match one of your router cutters. When you are happy with the fit of the back rail joint make the double saw cuts in the tenons and ease the outside edge of the mortises so that the tenons splay when the wedge is driven in. 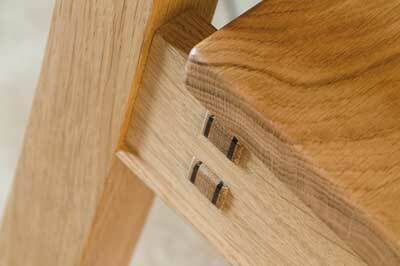 Aim for tenons that are a good push-fit all round in the mortise. Invert the joint: if the tenon drops out when it is shaken then either make another one or pack it out with a sliver of veneer. If the joint is too tight then return to the router table!